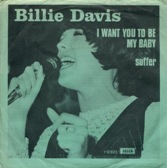 If you mentioned the name Billie Davis to any music loving person who remembers the sixties and ask what her first UK hit was, most will likely say Tell Him, which, in all fairness, was her first solo top 10 hit in 1963, but she’d actually charted the year before as a sidekick to cockney singer Mike Sarne. Yes, in 1962, Mike Sarne, who had topped the singles chart in June with Come Outside and featured the chirpy cockney voice of the late Wendy Richard, followed it three months later with Will I What and he invited Billie Davis to do very much what Wendy had done on the previous hit. It was Stigwood who gave her the stage name Billie Davis taking the Billie from the blues singer Billie Holiday and Davis from Sammy Davis Jr, whom Stigwood admired. Her first solo hit, and the one she’s most remembered for, Tell Him defined a sound that preceded both Dusty Springfield and Sandie Shaw and with her jet-black hair, big eyes and sultry looks she became a music tabloid darling. The follow-up, He’s The One only reached number 40. But this week’s subject is her third and final hit, some five years later which was called I Want you to Be My Baby. The song was written by Jon Hendricks, a jazz legend who had started his professional career, as a musician, in the mid-1930s while still in high school in Toledo, Ohio. He sang on the local radio station with a vocal group called The Swing Buddies and occasionally played local clubs backed by neighbour and friend Art Tatum on piano. This song was more of a jump blues track which Jon had specifically written for Louis Jordan who recorded it in 1953 with his backing group the Tympany Five. It was covered in 1955 by the comedy music act Lillian Briggs which was heard by the blues singer Georgia Gibbs who informed her producers, Hugo & Luigi, about it. They jumped on it straight away and had Gibbs flown over from her home in Massachusetts to their studio in New York and cut the song on the same day. The following morning promotional acetate copies were pressed and distributed to radio stations in New York. Both acts were rewarded with a top 20 hit, Briggs’ reached number 18 and Gibbs made number 14 but Briggs’ version sold more. She built a big fan base in Spain and even recorded a cover of the Moody Blues’ Nights In Wite Satin which she performed on Spanish television and it became a hit there. “The Spanish people really took me into their hearts,” she revealed, “I was playing bullrings and followed Matt Monro around the circuit, he had a huge hit there with Born Free. I also worked with Julio Iglesias and picked up an award for International Artiste of the Year,” which she said was the equivalent of Hello magazine. The songwriter Ellie Greenwich, as a teenager, saw Lillie perform her version at one of Alan Freed’s rock and roll shows and chose that song to launch her own singing career. Her version was produced by Bob Crewe and stalled at number 83 on the Billboard Singles chart in 1967. I Want you to Be My Baby continues to be covered and has done so by Lindisfarne and 80s one hit wonder Natasha. There was also a Finnish version called Armaani Sä Silloin Oisit by Wiola Talvikki and a version recorded by Chinese singer Grace Chang who recorded it in both Chinese and English – but not on the same disc. In 2000 Jon Hendricks returned to his hometown to teach at the University of Toledo, where he was appointed Distinguished Professor of Jazz Studies and received an honorary Doctorate of the Performing Arts. He was recently selected to be the first American jazz artist to lecture at the Sorbonne in Paris, which has been an established university since 1248. In 2012, Hendricks appeared in the documentary film No One But Me, discussing his former bandmate and friend, Annie Ross. Jon is currently 93 years old and living in Ohio. In 2007 Billie and the rock ‘n’ roll band, The Rapiers recently put on a tribute lunch for the late sixties singer Tommy Bruce, this event raised money for the Macmillan Trust. In more recent times, Billie has also been working with the heritage foundation, placing various blue plaques and raising money for various causes including the Tsunami Benefit, and poverty charities.